Tune in to the latest season of ‘QATV’ to get fresh ideas for contemporary quilting, explore a multitude of artful approaches to design techniques, and more. Hosted by Pokey Bolton, founder of Quilting Arts® Magazine, ‘Quilting Arts TV’ features many of today’s top quilt artists as guests including: Frieda Anderson, Wendy Butler Berns, AnneMarie Chany, Ginny Eckley, Ellen Anne Eddy, Elizabeth Hartman, Heather Jones, Jane LaFazio, Libby Lehman, Penny McMorris, Jenny Novinsky, Debra Quartermain, Sherry Rogers-Harrison, Luana Rubin, Sophie Rubin, Laura Wasilowski, and Carol Ann Waugh. In this incredible latest season, you’ll learn free-motion machine quilting designs and techniques; surface design—from screen printing to working with soy wax resist and dyes; modern quilting ideas; machine work including decorative machine stitching, bobbin drawing, couching, and trapunto; hand embroidery; a review of sewing machine feet; tips for tension adjustment; and plenty more! You’ll also be on your way to making projects ranging from quilts and wall hangings to festive table-top flags and pressing boards. Dive into the newest season of ‘QATV’ and fall instantly in love with each spectacular episode. I am in two of the episodes with my Rainbow Quilt. 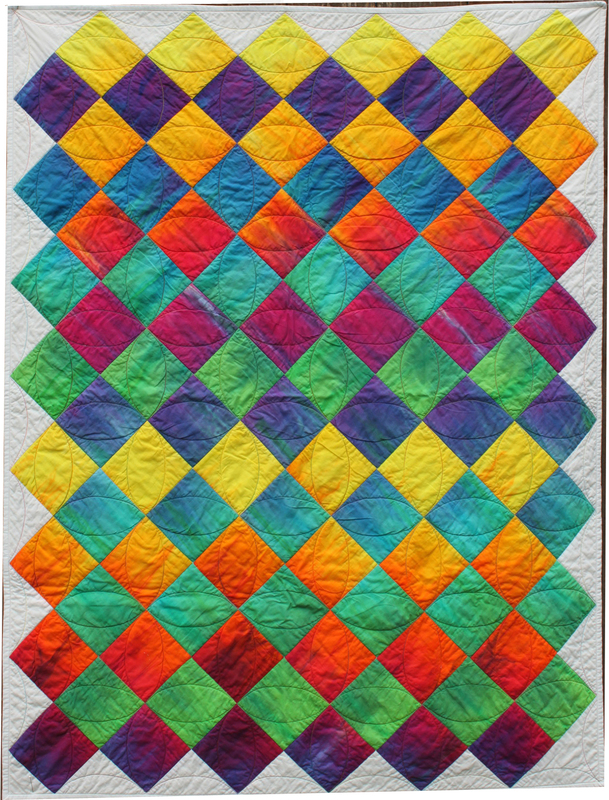 This perfect size baby quilt is made with two yards of my rainbow gradation fabric and one yard of white fabric. I hope you will check it out. I show you how to make the quilt and then how I machine quilted it. Behind the scenes with Pokey. It was so much fun to do the TV show!! I will have to do it again.